Enjoy simple documentation, easy data storage and access, and complete patient security with cloud-based EHR implementation. Talk to one of the experts at Aegis to know more about how EHR implementation services can help you. Aegis Health Tech from India offers innovative EHR development services for patient care and employee record maintenance. Our services overcome the current challenges and provide an optimal solution that helps in providing better service to the patients. We develop the EHR software that is customized to solve the everyday problems you face with maintaining records. By EHR integration in your healthcare service, you will be better equipped with a completely connected office where the details of the patients, employees and providers are integrated into the same platform. Not sure about how EHR implementation and EHR integration in your healthcare service could help? Schedule a call with our EHR consulting expert and see how EHR can be the answer to the problems you face regularly. Aegis Health Tech has a decade of experience in providing EHR development services in India as well as to other businesses around the globe. We spend considerable time in understanding the functioning of your healthcare business, your challenges and your requirements. We propose an EHR-based solution that will fix your issues and bring you peace of mind. We do not stick to one EHR system for all our clientele. Having worked with some of the top EHR systems available, we choose the right EHR system provider that will enable you to work from a single platform. Some of the EHR systems we have worked on as eMD, Allscripts, Groupcast, Greenway, etc. 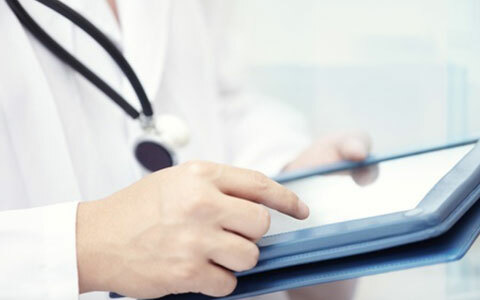 Patient-Centric: We focus on making it easier for you to store and access patient details, making the data available across all devices connected to the EHR system. Streamlined Workflow: You can manage your employees’ data better, assigning tasks and automating shifts through the EHR platform thereby avoiding confusions and redundancy. Meet Quality Standards: You can automate the regulatory reporting commitments to meet the quality requirements. High Scalability: If you have ideas of expansion in the future that would require complex EHR development, we can make sure to keep it ready for you from now. Speciality Service: We develop the EHR system based on your healthcare speciality and customize it to address the services you provide and the challenges you face. Interoperability: Our EHR integration service enables you to connect with providers, patients and other businesses and exchange records and data easily. At Aegis Health Tech, we provide a comprehensive EHR consulting service and support services that identify the glitches in your current process and provides a roadmap to put your resources to better use. EHR Consulting and Advisory Services: You may not have a complete idea of how EHR can transform your healthcare business. We guide you to envision the advantages EHR could bring to every application and the ways by which EHR can be the solution for your business challenges. EHR Legacy Support: If you already have an EHR system in place that crops up often with problems, it could hinder a lot with your daily activities. As we have experience in working with various EHR systems, we will identify and resolve the issues. EHR Training: If this is the first time that such a system has been implemented in your office, your employees will need a little guidance to work around through it. We provide EHR training that will quickly help you and your employees to make the maximum benefit from the EHR system. EHR Application Maintenance: If your existing EHR system needs to be customized or scaled, we can do that for you. We also provide 24X7 EHR support services that will allow you to access and work with the system without a hitch. For more information on our EHR services or to have an EHR consulting session with our experts, mail to hs@aegishealthtech.com.